Set in an 8,000 m² land planted with olive trees, oaks and blackberry bushes, this property is just 1 km from Les Vans. Guests are invited to relax by the outdoor swimming pool or in the shared living room. All of the rooms at Chambre d'Hôte Mas de la Garrigue are uniquely decorated. Each room features a private bathroom with a shower. A continental breakfast is included and served every morning in the shared living room. Guests can prepare homemade meals in the summer kitchen and dine on the furnished terrace. 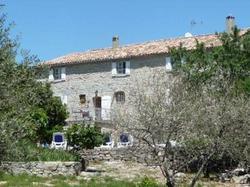 Chambre d'Hôte Mas de la Garrigue is 2 km from the forest of Paîolive and 20 km the Ardèche Gorges. Canoeing and climbing activities are possible just 3 km from the property. This room has a unique décor and features a private bathroom with a shower.